Shruti Haasan's marriage plans ! 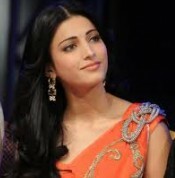 Shruti Haasan recently emphasized quite strongly that she does not believe in the concept of arranged marriages. She said that she will undoubtedly have a love marriage but at the moment she doesn’t have the time to devote herself to any sort of romance. On the other hand, her father Kamal Haasan was reported in the media saying that he regretted being married at all. Looking back at his divorces, Kamal said that he never subscribed to the institution of marriage and he only obliged himself into it to please his partners then.